Muse mainman Matt Bellamy is no ordinary guitarist and his gadget-loaded Hugh Manson custom electrics are similarly extraordinary. Mansons Guitar Shop in Exeter, UK, has announced details of one of the most exciting production guitars in years: the Manson MB-1 Matthew Bellamy signature model. 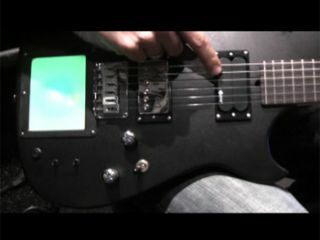 Easily the most technologically advanced signature guitar on the planet and based on Bellamy's own cracked mirror M1D1, the MB-1 features a sustainer circuit and an X/Y MIDI controller pad (like that on a Korg KAOSS pad) that can be mapped to control anything from a particular effect parameter to stage lighting. The MB-1 will be followed by the DeLorean later this year, which looks set to incorporate an optional Zvex Fuzz Factory beneath an aluminium fascia. For more spec, pictures and pricing info, head over to the official Mansons website, or check out the issue 316 of Guitarist magazine, in stores from 12 May.